Local vs online conveyancing: Which one is right for me? If you're serious about buying or selling property, you'll need to enlist the help of a conveyancing service. But did you know it's now possible for most of your conveyancing to be done online? Online conveyancing enables faster reviews of legal documents. Local conveyancing gives you more face-to-face time with your conveyancer. Login and check the progress of document signings anytime with online conveyancing. Document reviews with a local conveyancer can significantly prolong the process. Gone are the days where you had to meet up with your conveyancer in person for every little update on a document or general discussion about the terms of a property contract negotiation. Conveyancing online enables both the customer and the conveyancer to handle a lot of document-heavy tasks online, without the need for face-to-face meetings. It's up to you to decide which format of conveyancing service is best for your property transaction, whether you're buying or selling. Some people prefer the more personal and friendly interactions they can get from a traditional conveyancing service. Others simply can't dedicate enough time to the process of conveyancing face-to-face. This is where online conveyancing can help. Choosing between a local and online conveyancing company can be tough unless you know what they can offer you regarding service. Experienced conveyancers and lawyers are generally better at handling complex property negotiations. Through experience, they will be better equipped to handle any problematic situations that may arise. A local conveyancer may be more familiar with issues that come from property title transfers in a particular suburb. But that doesn't mean an online conveyancer hasn't experienced the same thing from property transfers in the past. Due to the nature of conveyancing online, it can cost less than it's traditional counterpart. Valuable time can be spent on face-to-face meetings every time documents need to be reviewed. This can end up costing you more if a traditional conveyancer decides to charge you by the hour for these meetings. Online conveyancers don't need to facilitate face-to-face meetings with clients or charge you fees for these hours. Through a virtual settlement room, clients and conveyancers can sign and verify documents as well as pay for settlement funds. Through this online platform, clients can also check on the progress of documents wherever and whenever they want. It's another way of cutting out valuable time that would have usually been wasted calling up a conveyancer for an update. An online platform also eliminates the need to send documents through the post. It gives you the ability to transfer documents almost instantaneously. In the end, both parties involved in conveyancing online save valuable time on transferring documents. Conveyancing online enables faster transactions and shorter turnaround times for all processes involved with document handling. Some online conveyancers also offer the ability to receive video calls. This method of communication still puts a face to the name of the professional a client is dealing with. In a digital age where services often become less personable, video calls can give a customer more peace of mind. How can you avoid potential risks? With the introduction of conveyancing online, it can open up the possibility of technology-based fraud. Ensuring both parties are following Verification of Identity (VOI) procedures can help alleviate any stress or mistrust during the conveyancing process. VOI is a process to confirm the identity of a person. VOI regulations reflect the guidelines produced by the Australian Registrars' National Electronic Conveyancing Council (ARNECC). If your conveyancer follows VOI procedures, you'll have better protection against any possible fraud in relation to your property transaction. Checking up on VOI procedures undertaken by both parties can ensure you are better protected against property fraud.If you are in any way involved in the sale or purchase of land, your conveyancer should be asking for certain documents to prove your identity. The conveyancer for the opposing party of a property title transaction should also be following VOI processes with their client too. The choice between local and online conveyancing is up to you. 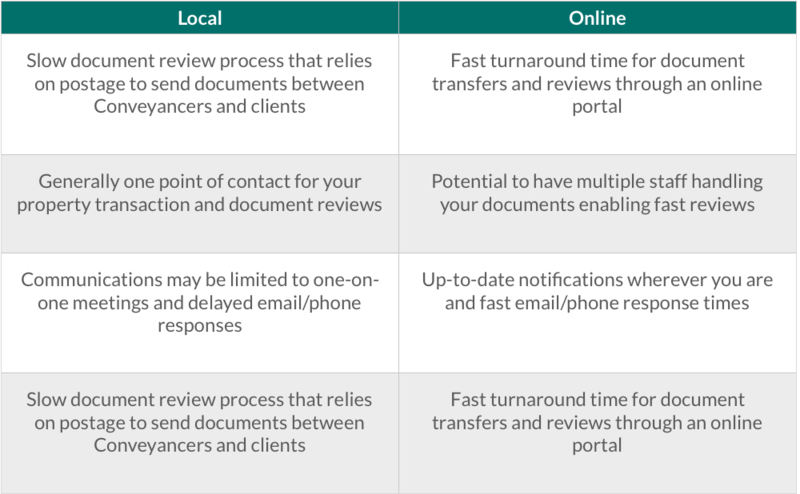 A local conveyancer may provide a more personal service with face-to-face meetings, but that also includes more drawn-out processes for document handling. An online conveyancer can provide a faster and simpler solution for document handling, signing and payments for settlements. Your choice of a conveyancing service can influence how time consuming the process will be. It's up to you to decide which option better suits your needs and personal situation. For a fast and convenient solution to conveyancing, get in touch with conveyancing.com today. If you're selling or buying property, chances are you may come across a few terms you've never heard of. Check out our comprehensive glossary and familiarise yourself with conveyancing terms today. Looking for a Conveyancer but don't know where to begin? Asking the right questions can help.